Arc’teryx was established in 1991 in North Vancouver, British Columbia, under its current name, but the brand’s story starts two years prior, in 1989. It was originally the company Rock Solid, founded by Dave Lane, which went to become Arc’teryx after the then-principal Jeremy Guard decided on the name change of the brand in order to represent the “evolutionary” innovation that the brand was undertaking with outdoor gear and clothing. When it started out, Arc’teryx was not solely an outdoor clothing brand but also a climbing gear one and at the time, they launched the Vapor harness, which is one of the most popular items of the brand. They then moved on to backpacks, designing the Bora backpack (check it out on Amazon) using the thermolamination technology that was also used in the harness. The outdoor apparel ventures came after Arc’teryx obtained the license for using the Gore-Tex fabric technology, which, at the time, was one of the only available high-performance fabric technologies. We have written many pieces on Gore-Tex, where we compared it to other technical fabrics such as H2No, DryVent and many others. Nowadays, Arc’teryx has established itself as one of the best outdoor brands available due to the high performance designs and the great quality of their products. They feature many different product lines made for different purposes and customers, such as LEAF, designed for military and law enforcement and Veilance, a luxury line that combines business wear with functional clothing. In our comparisons, something that we have encountered often is the focus on sustainability of many brands. This is a very important matter, considering that these brands manufacture numerous products each year and ensuring that they do so ethically and without considerable harm to the environment is the best way to go about it. Arc’teryx is also a brand that takes environmental protection very seriously, by ensuring the animal-based materials used in some products are sourced through ethical means and from suppliers that treat the animals humanely. A very important focus is placed on product longevity, thus creating products that are not only high quality just for the sake of being high quality, but so that they will last long and thus requiring less products to be re-manufactured. In regards to technologies used, the functional apparel relies on Gore-Tex, but they also have developed their own AC2 technology, which is used in their packs. The fabrics and raw materials used by the brand are Bluesign® certified, which guarantees that the materials used are safer for human use and the environment. In regards to the manufacturing process, they make a majority of their products in Canada, but they have also expanded their production means in other countries around the globe, all the while maintaining close relations with each of their facilities and abiding by the regulations of labor and human rights, making the whole process ethical. The resulting products are some of the best-performing designs on the market, not solely in regards to wear, but also longevity, style and look. 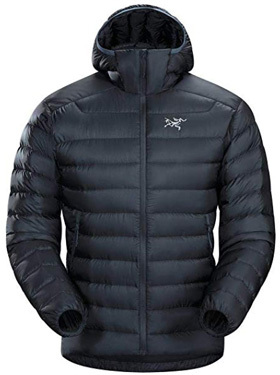 We have picked two jackets by Arc’teryx, the first one being the Cerium LT hooded jacket for men (check it out on Amazon), a design that is made of 100% Nylon taffeta on the shell and insulated with 850 fill power white goose down, which is the best-performing type of down in regards to insulation. However, the insulation is not solely provided by the goose down, but also by the Coreloft synthetic insulation, which helps counter the main issue of down, that of becoming practically useless when wet. Being synthetic, Coreloft manages to provide insulation in areas where the chances of the jacket wetting out are higher, in the sleeves, underarms, shoulders and collar. It has elasticized sleeves and a low-cut hem on the back, providing better cover when sitting. This is a water-resistant jacket, but as with all down jackets, it’s better suited for dry weather. 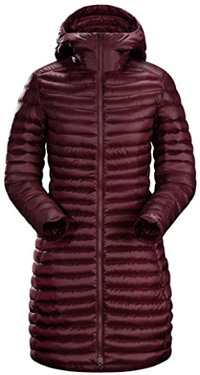 The design for women we have picked is a minimalistic parka, the Nuri Coat (check it out on Amazon), which is made of 100% Teprine Nylon and insulated with 750 fill power European grey goose down. Like the design for men above, it also has strategically-placed Coreloft insulation and it also has an attached hood that is down-insulated for added warmth. Arc’teryx is not the most affordable brand, as their products, especially jackets, typically start at around $150 and go upwards of $400 on several of their designs. Are these jackets worth their price? When considering their overall performance and quality, these are very long-lasting jackets and high-performing, making their price reasonable in regards to their quality. 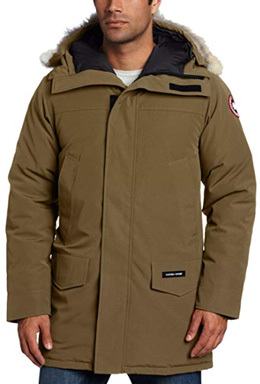 Canada Goose was founded in 1957 by Sam Tick in Canada. It was originally known as Metro Sportswear Ltd. and it got the Canada Goose name when the brand entered the European market, after they created their first down jacket in the 1970s. 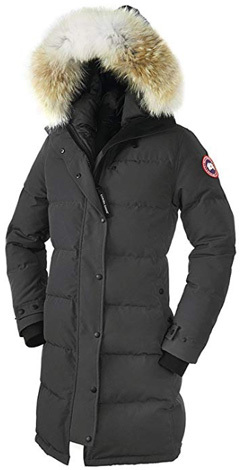 Canada Goose is one of the most renowned brands when it comes to down jackets, as they are regarded as the warmest jackets you will find, making them a popular choice among those who live or work in really cold areas. But their warmth is not the only thing that makes these jackets so popular. They are very well-made, too, and their quality is so high that they are reported as lasting for decades with proper care and maintenance. Other reasons come into play, and you can find some of them in this piece of ours, where we explore why Canada Goose is so popular despite the really expensive prices of its products. As with most brands that design outdoor clothing, Nylon and Polyester are the main fabrics used. When it comes to Canada Goose, the fabrics used are high quality, which helps the finished product last longer. Being renowned for the down-insulated jackets, the brand uses mainly goose down (but also duck down in some jackets), which is responsibly sourced and is fully traceable, per the Responsible Down Standard. The birds are humanely treated and not live plucked. Merino wool and coyote fur are two of the other natural, animal-based materials used by Canada Goose and they are also both sourced responsibly. There have been some controversies throughout the year about the use of Coyote fur, and despite it being sourced from areas where coyotes are considered pests and the populations are abundant, the brand is striving to use it less and less in their more recent products. The manufacturing process of Canada Goose is extensive, comprised of 13 steps during which the smallest details are checked, in order to guarantee that the finished products are the best of the best in regards to their quality and finish. The first design is the Langford parka for men (check it out on Amazon), a jacket made of 85% Polyester and 15% Cotton, insulated with 625 fill power white duck down. This is a smooth parka, with four outer pockets and regular sleeves. It is cut slightly longer and it comes with an adjustable hood, with removable coyote fur trim. The design for women is the Shelburne parka (check it out on Amazon), a long and quilted parka with coyote fur trim on the hood and wrist gaiters on the sleeves. It is an elegant design, with a storm placket covering the central zipper and made of 85% Polyester and 15% Cotton, with 100% Nylon lining and insulated with 625 fill-power white duck down. 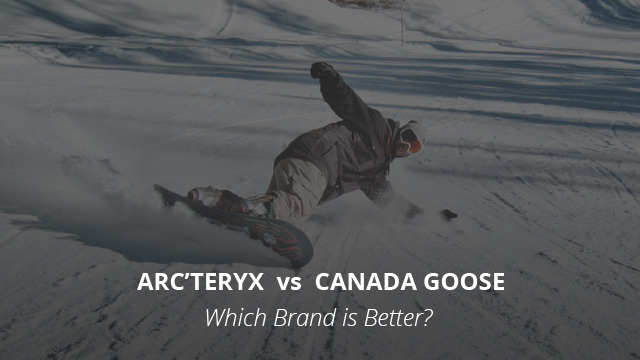 Like Arc’teryx, Canada Goose is not the most affordable brand either. Its products are quite expensive and they can go upwards of $600 on many of their designs. Overall, the jackets made by Canada Goose are really high quality and they do justify their price. They are warm, well-made and long-lasting. Whether they are worth the price for you, then it depends. If what you are looking for is a jacket for very low temperatures, no parka out there can compete with the Expedition parka by Canada Goose. Overall, this brand’s jackets are made for freezing weather and in that regard they are a great choice. However, the style range tends to be a tad limited, but the jackets and parkas fit well and wear comfortably. Arc’teryx, on the other hand, provides a lot more options, as it is not just a winter-weather brand. Their main focus is on technical pieces and as such there are many more designs to choose from. However, when comparing like to like, Arc’teryx rivals Canada Goose quite closely, as their jackets are very high quality and the down designs fare really well in below 0 temperatures. All things considered, price, quality, performance, options and durability, in our opinion Arc’teryx is the better brand. It is one of the most beloved and recommended brands online for outdoor clothing, rivaling also other similar brands such as Patagonia or The North Face.